suddenly crippledtrimaran that has now retired from trying to beat that record . 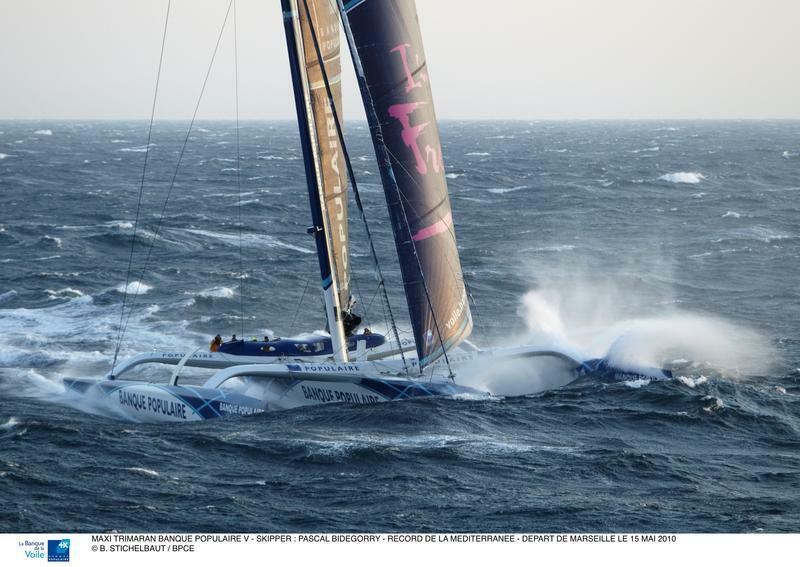 . .
Honey navigated Franck Cammas’ 105-foot Groupama 3 to a 48-day circumnavigation that shaved two days off the previous record held by Orange II, Bruno Peyron’s 121-foot catamaran that by comparison was built for stout, to perform in extreme conditions. But those extremes, on average, represent only twenty percent of the measured 26,000 miles of a record-course circumnavigation. Orange II struggled in two transits of the temperate zones. Thus the new strategy. Honey says that Pascal Bidegorry’s Banque Populaire V, “Is conceptually like Groupama 3 but 30 feet longer, with the same beam—I think because they didn’t need more stability—with more displacement and as much sail as an Orange II. 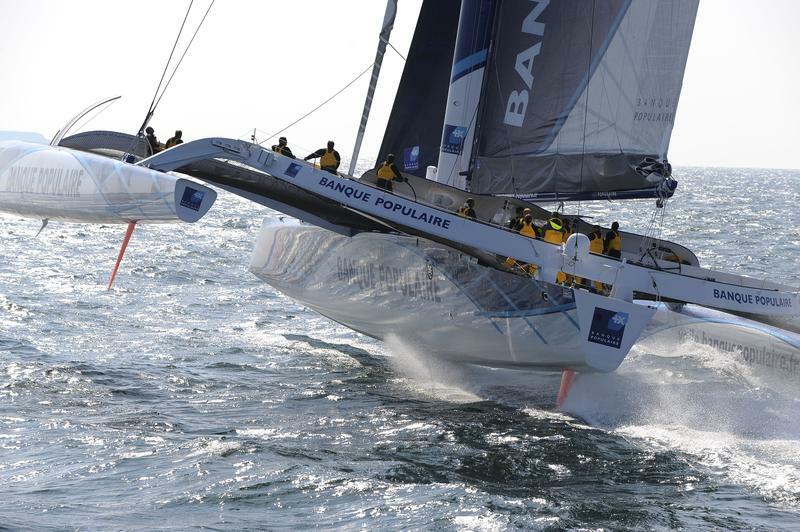 Banque Populaire in its outbound, north-south transit of the Atlantic had been sometimes ahead, sometimes behind the time of Groupama 3, but collided with something in the water while sailing at a reported speed of 37 knots. The incident happened in the predawn darkness Thursday. The crew diverted north, for calmer wind and water, where they were able to extract a damaged daggerboard from its housing. The daggerboard was missing a huge chunk, and repair attempts failed. There is something like a 70 percent failure rate on these attempts, as earlier proved by failures including those of earlier attempts by Groupama 3. With Banque Populaire V and its crew of first-time circumnavigators soon to enter the Southern Ocean, what better time to check in with a man who was on the short-short list for world’s greatest navigator long before he was named the new Rolex US Yachtsman of the Year. (He receives the award in New York City on February 25, not quite catching up with Sally Honey, his wife who has won the women’s version twice.) Here we see Stan on the round-the-world record voyage, looking a bit shop weary. Let’s forget, on this pass, the man’s other sailing achievements, his aw-shucks decency, his co-invention of what we now know as gps navigation for automobiles, and the fact that he is far and away the leading developer of electronic sports graphics. Forget that he is a leader of the team now creating next-generation broadcast graphics for America’s Cup 34. Stan had the audience in the palm of his hand. So let’s not think of this as byline journalism on my part. It’s just me, parroting Stan Honey, with a bit of the editing that helps translate spoken words into a read. Having said that much, I’ll get out of the way and let Stan talk about averaging 24.74 knots through the water for 28,691 miles, all the way around the world. 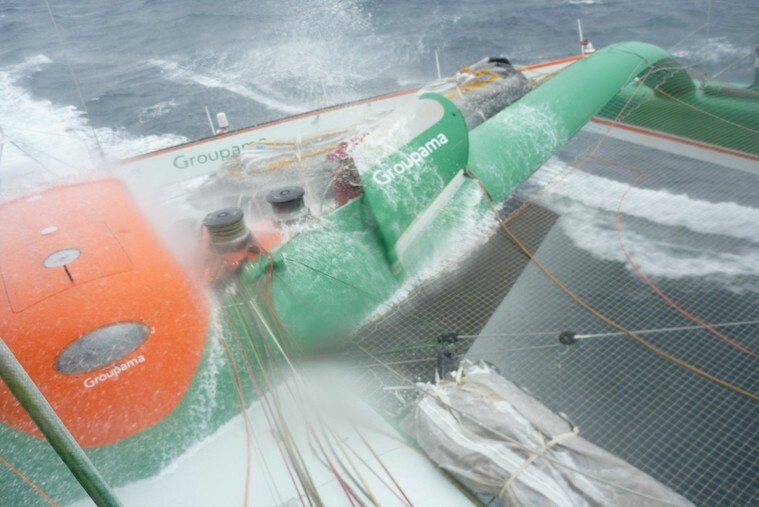 In the entire circumnavigation, Groupama 3 spent a total of three and a half hours in winds over 36 knots; twelve hours in winds over 34 knots. I’m proud of the way we met the goal of avoiding weather that was bad enough to break the boat. 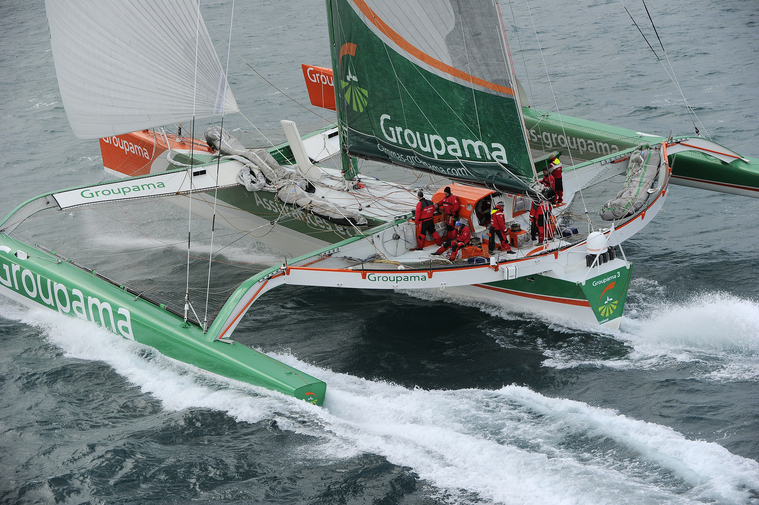 Why are boats like Groupama 3 and Banque Populaire V fast enough to do that? The amas are narrow, and you sail on just one, using the center hull as a sort of training wheel. The center hull has a lot of rocker, like the Oracle trimaran, and you’re using that rocker so that it’s just barely kissing the tops of the waves. Seventeen tons of boat is supported by the leeward ama, and it’s thin as a needle. Even so, stuff it into a wave and you start to develop drag, so there is a semi-circular lifting foil to keep the bow out of the water and the stern in the water because, of course, you need that rudder. About 70 percent of the displacement of the boat is carried on that semicircular foil. The premise of Groupama 3 was to build something relatively small and nimble instead of a monster like Orange II or Playstation [Honey navigated a transatlantic record on Playstation] which are bruisers by comparison. The intent was to be light and fast transiting the Atlantic, north-south and then south-north. Once you’re in the Southern Ocean, your speed is set by the storms. Banque Populaire V is conceptually like Groupama 3 but 30 feet longer, with the same beam—I think because they didn’t need more stability—and it has more displacement and as much sail as an Orange II. Leaving Europe southbound, from the start, your course takes you toward South America, to skirt the South Atlantic High. Then the object is to catch a storm out of Brazil and ride it halfway around the bottom of the world. When that one sinks south, probably about halfway across the Indian Ocean, you catch another storm and ride it all the way to the Horn. Two storms around the bottom of the world, and the storms go as fast as they go, but the boats are faster than the wind in almost every case. All you have to do is be fast enough to stay in front of the storm. It’s very hard to pass a front. There’s that light spot in the middle, and when you hit the light spot, the front is moving away from you and its backside is catching up. But this was the storm we needed. Twice we got close enough to feel puffs of breeze from the leading edge, and we couldn’t make it through. Then we had a different kind of opportunity. There was a stationary trough up ahead, and in theory that would slow the advance of the front for about an hour. That looked like our shot, and we took the shot—as navigator, I was the only American on an otherwise French team—but I think maybe by then the crew was beginning to look at me and wonder. We got through and we got out front and carried that storm all the way across the Indian Ocean and one-third of the way across the Pacific. We took 17 hours off the record for that stretch. Your ultimate helping hand, the Transpac Race Preparation Seminar, promises to be the best-value $25 lunch you ever had. That is, the total fee is $25, and lunch is included, for a day that addresses every point in the Notice of Race. Don’t have an ORR rating?· Dan Nowlan, US Sailing Offshore Director, will tell you how to fix that. Wondering what sails to bring or not? 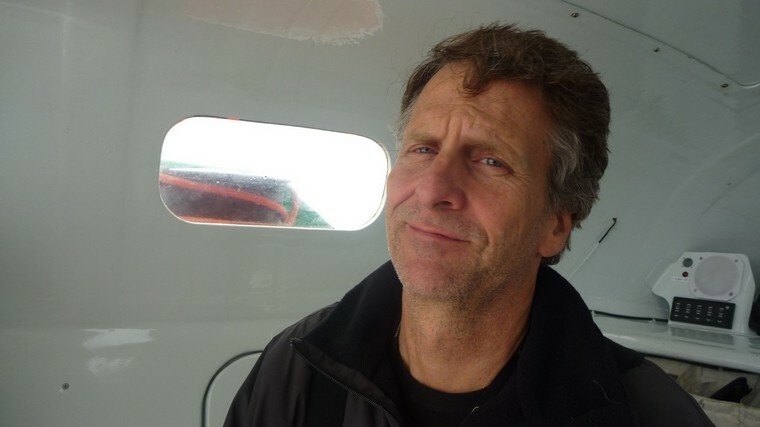 Ask sailmakers Erik Shampain and Scott Poe. Communications, provisioning, boat prep, the entry process, boat inspections, race orientation for first-timers, it’s all there, and that’s why you should be there too. Planning your route, “picking a lane” in the tradewinds south of the Pacific High Pressure Zone, is the ultimate key to success. Navigator Ernie Richau will be your guide. This seminar is ideal for first timers or for anyone looking to step-up their game en route to the world’s greatest ALOHA.